Over the past month or so, I’ve allowed a few milestones here at Broken Cookies Don’t Count to pass unmentioned. It wasn’t intentional, I just didn’t think about it at the time and it seemed a little silly to mention later. I pay attention to the stats here, but I don’t do this for the stats. First, I have now written 425 posts, this one will be 426. I’m excited that I’ve stuck with something for this long. It has become a huge part of my life and I don’t see a reason why I would stop anytime soon. I remember last fall, when Ralph and I were on our long trip out West. I excitedly told him that my page views were about to hit 10,000. He didn’t quite understand what I was talking about, but he was happy and proud nonetheless. As of about 6 months later I’m at 24,410. That’s more than double and I’m pretty excited about it. It’s still a happy day when it goes over 100 and I see that more frequently now. I have all of you to thank for it, and believe me, I thank you. The biggest milestone, and one I could not forget to mention comes today. Last March, I started to realize that I had a big problem when it came to snacking and Weight Watchers. I would go to WW on Saturday, take what I got from the scale and then go about my weekend. My weekend, as it still does, includes a little more flexibility with the program, knowing I have a week to tighten up my efforts and do well the next Saturday. Back then, the “weekend flexibility” almost always included chips of some kind or another. I wasn’t always getting the results I hoped for on the scale. I started to think that perhaps my weekend escapades had something to do with it. Lent was coming and as of Ash Wednesday, March 9, 2011, I decided I would give up chips for Lent. I gave them up and didn’t think a lot about it, but as the weeks went on, I realized a change in my results on the scale. I was losing weight and it was staying off. Hmmm….Not much had changed other than the lack of chips. Easter came and went, I ate no chips. I kept not eating chips and I kept losing. I was actually able to get below my Weight Watchers goal and finally get back to my personal goal weight and below it! I made a decision. No Chips For Me! Today is one year that I have not eaten chips. When I say chips I mean Doritos, potato chips, Sun Chips (my favorite), chips with Taco Tuesday. All Chips. One year later, I am still below my Weight Watchers goal and very close to my personal goal. Do I miss them? Yes. The worst thing is the mindless eating that can occur if I’m somewhere and they’re just sitting out for me to eat. Not thinking I may start to reach for them, but I always catch myself. Have I achieved World Peace? No, but I’ve accomplished…no, Conquered something I thought would always dog me. I don’t know if this is forever, but I am able to sustain this at the moment and I am very pleased with the results. Before I leave you…A sign of Spring!! 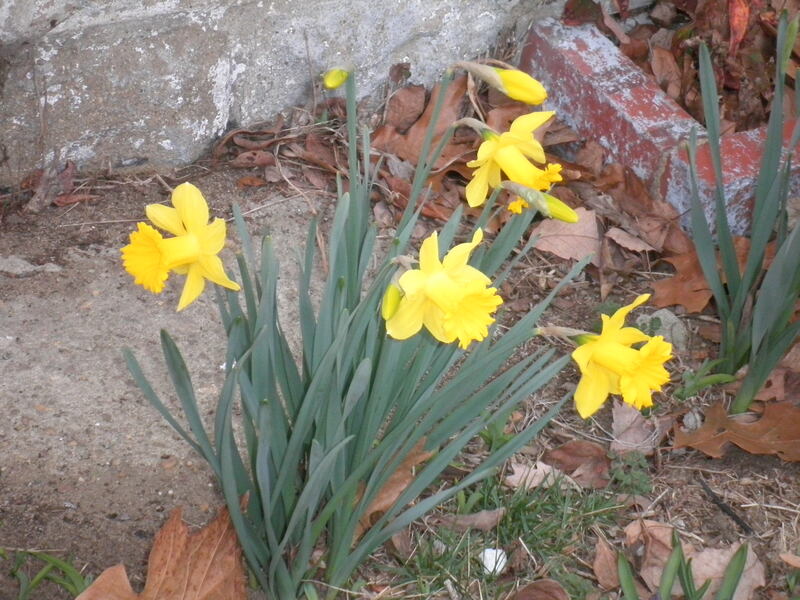 Daffodils in the side yard! Such a pretty day yesterday! Happy Friday!! No Chips For Me!! Diane!!!! I’m so excited to hear from you!! I personally always think that attending meetings is the best. You’re Lifetime, right. In NJ they have a special for lifetime members. They give you a code and you can get the e-tools for free for eight weeks. You just have to get a new code every eight weeks. I haven’t done it myself yet because I’m slow and stupid but that is very helpful. I do think you should attend the meetings. They do help so much. So glad to hear from you. Please come back and send a big hello to John!!! Congratulations Fran on all your successes! I’m sorry I don’t get to comment as much as I would like to but you are doing awesome! See you tomorrow! You are an inspiration! Eleni, thank you so much, I really appreciate it. I know you’re reading even if you don’t commnent!! Congrats on those personal accomplishments, Fran! Giving up something you really like is no small task (and neither is blogging regularly–although it’s a lot more fun than not eating crunchy salty things 😀 ). And, oh, but would life be worth living without a little bit of peanut butter in the mix? Allie, you’re so funny, but I’m having trouble lately. There’s a jar and there’s a spoon and then there’s me. Not a good combination. I’ve got to work on this. I’m so proud of you. I’m so proud that you are writing. I’m so proud that you are succeeding at WW. I’m so proud that you are my sister….heck, I’d be proud of you if you just stood still and breathed! I know how much your writing has always meant to you and I am so glad that you are finally doing it for others to enjoy and be inspired by! Thanks, Ele. As always, you are my biggest supporter. Thank you, Thank you. How do you feel about kale chips? Ginny, I haven’t tried kale chips, but I wouldn’t consider than out of bounds because they’re real veggies and good for me. I don’t seem to find kale in the stores around here. I need to try to find it. Fran that’s huge!!!! I could forget all chips except tortilla chips, they hold a huge place in my heart. Good for you. Marie, I do miss them, but right now, this is helping me so much, I think I have to stick with it for awhile, sad but true. Well done on the chips! I agree with you about peanut butter. If I have it out of the house, it works. In the house? it’s all over. Hi Amy, I’m glad I’m not alone on the peanut butter. It worked with the chips, hopefully it will work with peanut butter! Congratulations on reaching the milestones and all your success Fran. You are an inspiration. Have a wonderful weekend. Thanks, Roz. I keep trying! Have a great weekend! Thanks, Erin! We just have to keep plugging along, that’s all we can do!